We’re half way through April already! April is a month of birthdays in my life. Just yesterday my mother-in-law turned 88 and my husband’s godfather turned the big “90”! He is in good shape both physically and mentally, with a sense of humor and wit that keeps me on my toes and laughing. My mother-in-law is very tiny and her mind is deteriorating from dementia, but she is still very much with us. I remember when my father turned 90. He was in a rehabilitation center working on building his strength up so he could move back home and walk again, albeit with the help of a walker. I made apple pies for everyone and we brought in sparkling apple cider to be more festive with something bubbly. He had a really great time, but was worn out at the end of the celebration, and wasn’t quite sure who the celebration was for. The presents and celebration in his honor just didn’t seem to make him realize it was for him. But the good news is he did come home from rehab and I am grateful that we had him in our lives for another 18 months. He celebrated his 91st birthday last year, and was even more confused about whose birthday it was. I recall my brother and his wife had given him a birthday balloon as part of the festivities, which we put by his bed since he spent so much of his time there. As we put him to bed that night, he looked up at the birthday balloon and asked whose birthday it was. On April 30 this year, dad would have turned 92, but he isn’t here to celebrate. I’m already dreading how I’m going to feel that day. Ever since I can remember, over 50 years, I have been celebrating a happy occasion that day. Death is so final. I have decided to do something positive and possibly cathartic in his honor. I am going to write a book on grieving that is stories, and not full of theory, but just practical stories around death, love and grieving. If you would like to share yours, please let me know at ellen at thebisource dot com. BTW look at what I almost stepped on while we were hiking in the Colorado mountains recently. It was the only floral beauty up in this area. We decided to take a snack break and went off the trail! 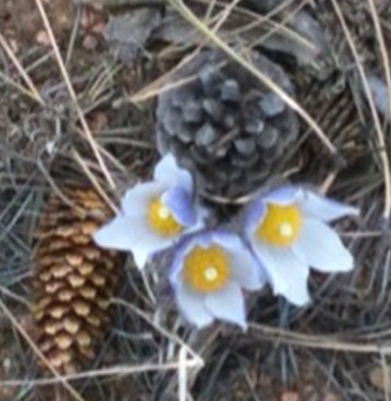 It’s amazing what you find in nature, and it gives me such comfort to see spring this year! I recently celebrated a birthday and it was in a beautiful snowy spot in the mountains and woods of Colorado. 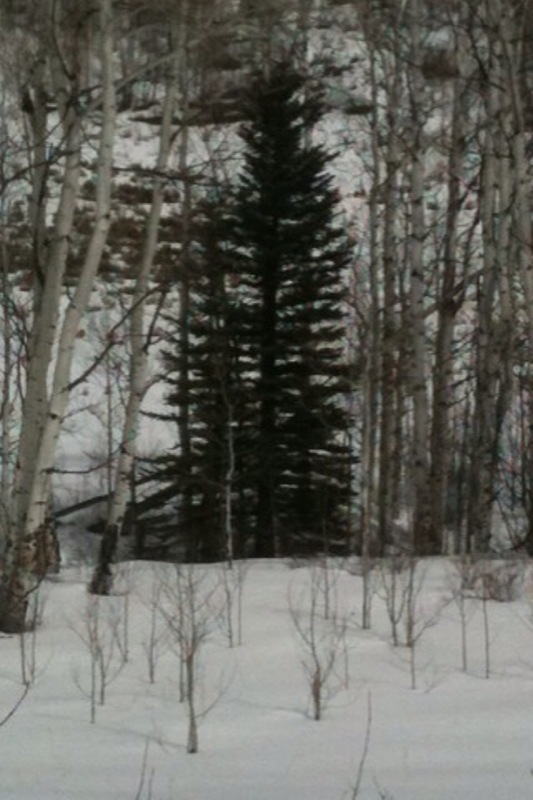 I particularly love this picture of the Spruce trees surrounded by the Aspens. In a cooperative and loving spirit, I want to share a poem that a dear friend handwrote to me for my birthday in 2009 written by John O’Donohue. The theme behind this message is that you are loved, and makes me grateful for friends, my many blessings and what I continue to learn through my mistakes and disappointments. In the gray wall formed around you. In an odd way this poem evokes life and death as I think about praising my mom and dad who loved me before I was…and trusted to call me here with no idea of who I would be. The miracle of life is so incredible, and in a similar vein the pain we feel when we lose our parents evokes such feelings of grief. I think this is a contemplative poem to recall once a year, and I imagine depending on my life’s events, different sections will speak to me. A few days ago when I read this on Robert White’s Extraordinary Minute blog, I skeptically thought, “yah, right”. Well yesterday I awoke to a new experience of my dad since his death. I awoke with the vision of my dad, albeit just a quick mental glimpse, as a younger, middle-aged man! Wow, it was a warm feeling that drifted through my body. I could feel the energy of his younger body and spirit as I peered into his face and his soul, almost disbelievingly. You see up until now, I only dreamt of my dad as a dying man, and often had flashbacks about what he looked like in death. That experience was just too much out of the ordinary and somehow got sketched and implanted deep into my visionary and emotional memory. While intellectually I am certain that this must be a normal, human experience, I know it is up to me to move past it, while not denying it. I was blessed to be with my dad and our family as he crept towards death and died in our midst, surrounded by love and care. Just last week I had received an email from a dear cousin who had lost her dad a few years ago. She said when she suddenly thought about her dad, she still cried for him. However, she now remembers him as a younger, more vibrant man, also without Alzheimer’s, the disease he and my dad shared in their later years. I wanted to share this since dad had been dead for 4 months and 10 days before I had this gift of life, of who he was most of his life! As this was my first emotional glimpse, my feelings aren’t that well developed. I just saw a happy man which my Father was! This is a good start and I am grateful that my grieving process is progressing and I got to feel and see dad as the more vibrant, happy and intelligent man that he was for most of his life! After all isn’t it better to remember someone you love—more as you saw and felt them—before they became so weak, old and memory poor?